RAD and Waiting: two opposites! 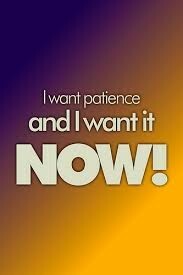 “Patience is not the ability to wait, but the ability to keep a good attitude while waiting” says Joyce Meyer. Children often struggle with that skill as much as they struggle with self control. They are often impatient and anxious to have what they want or to have their way. I have so many requests to teach how to get children to be able to just CHILL, instead of driving parents and teachers crazy with requests for more…NOW!! I saw Sprout doing his crisscross sitting by the stove as I came in for breakfast. He looked so still and straight and quiet it made me smile. His Awesome Mom, Judy, bustled efficiently around the kitchen nearby. She burst into song with gusto that always cracks me up. We chatted. A few minutes passed as we conversed while the little guy sat and waited for his stove cleaning chore to be checked. As we visited I wondered when she was going to call him to her, hug him and then inspect his work as she did most mornings. It was about five minutes later when she did! WHY!? I like to be on time. I get a knot in my stomach when I am late and someone has to wait for me. I feel rude wasting people’s valuable time. Time is priceless! So when a child has to wait for their parent is it right or wrong? Is it rude? Is it wasting the child’s time? I believe waiting is important for children to do daily to build patience, tolerance and increase skill building. Sprout grabs a book as we get ready to go shopping. Wise! Someday his employer or wife will need him to wait and he will be skilled enough to not build up frustration and anxiety that causes relationship problems. He has also learned to entertain himself by just observing. He is not given a pacifier such as a video game or cell phone. The goal is to build a strong child here! How did this extremely disturbed child with RAD and FASD develop patience? Strong Sitting and an Awesome Mom are the keys! She sets an example of calm patience in the face of his rages (or sometimes he would just fire her!) when he did not get his way. She models the same tolerance with the insurance company when they cancel her insurance unexpectedly and are unprofessional about it after hours on the phone attempting to resolve it. Sprout is watching. Your child is watching how you handle things.. the rude driver cutting you off.. the mother in law..that neighbor…TAXES!!! They see, and hear, how we handle difficult situations. Strong Sitting is an excellent exercise to build self control and patience. Dr Foster Cline invented the term and put it into practice with emotionally disturbed children in the 70’s. It is kind of a yoga pose that has been used for several thousand years yet, recently the Brain Gym folks did some research on it and found it does amazing things for the brain! All the groups have a slightly different style to it and a different name. When I teach it to the schools we call it Crisscross sitting. The point is.. they use self control to sit cross legged on a rug or a chair and with their back straight. They cross their arms opposite the legs. I start mine sitting perfectly still and quiet for 30 seconds and challenge them each day to increase it until they can sit for 1 minute for every year of age. A 10 year old would sit for 10 minutes. Having a post-it on the wall with a positive affirmation written on it takes it up a notch! Today I asked sprout why his awesome Mama sometimes has him sit for a while when he is ready. His reply.. “To practice my patience to get my brain stronger.” It sounds to me like it is WORKING! PS. I wrote this while I was waiting in the car!